First of all I'll start by giving information on direct male ancestors and then I'll expand it to include other family members. Captain de Infantrie Marine and eldest brother of Henri, Captain de Grenadiere and Pierre Capitaine d'Artillerie. Married first to Anne Labrit, their son Pierre born 1706, then to Marguerite Brossard. Pierre was born c 1706 or 1707 at the Chateau Vergnassade near Montastruc. He was, like his forebears, destined for the army and had a long and distinguished military career. 1st Lieutenant 1746; 2nd class captain 1748; Knight of St. Louis 1749; 1st class captain 1754; Brigade Chief 1765; Lieutenant Colonel 1766; Colonel 1773. Twelve war campaigns, 20 sieges, 5 battles and one wound and died in his own home at Montastruc on 6 February 1788 aged 84 years. It appears he was married three times; firstly to Francoise Dupeyrat (d. 1745) producing a child, Alphonse Denis; secondly to Francoise Sauvan de la Salle, Pierre and Jean (1752 - 1812) were possibly the sons of this marriage; thirdly to Marie Marguerite Chefdeville (d. 1st May 1777 aged 70 at Montastruc), the widow of an officer. This third marriage resulting in the birth of André Charles in about 1757. André was the third son of Colonel Pierre de Mestre and was born at Montastruc in 1755 or 1757. Like his father and grandfather he was destined to join the army. The army records tell us that at the time of the American War of Independence (c1780) he was a 2nd Lieutenant in the Regiment at Metz. In 1777 the Regiment sent its 2nd battalion to the Antilles. Two companies of the first battalion were sent to America in 1780 and two others followed in 1781. In all the regiment had 10 companies in the Army of Rochambeau; the other were stationed at Saint Dominique and in various Antilles Islands returning to France in 1784. It would appear that André may have been part of the regiment that spent its tours of duty in the Antilles. 27 August 1784: Report of the inspection of 1st and 2nd Lieutenants in the Royal Corps of Artillery, Regiment of Metz by M. de Gomer Inspector General. Brigade of Ducarroy, Company Lepelletier d'Argers: "the cavalier De Mestre: note on the disposition of the artillery during a siege, note of his knowledge of the appropriate timber for use of artillery, note on the subject of bombs." 1 September 1784: Artillery Regiment of Metz. Inspection made at Strasbourg by M. D'Aboville, Colonel of the Regiment. Second Lieutenant de Mestre, "Carried out his duties of service with exactitude and intelligence. His command was good generally." 1 November 1784: Captain 2nd Class of a company of Mechanics in an Artillery corps in the colonies. 15 February 1788: Requested 3 months leave to treat business with his brother following the death of his father (6 Feb 1788). Feb - April 1788? Married Hélenè Cotterel at Rennes. 15 November 1790: Melanie Caroline Jeanne born at Lorient (Morbihan) Brittany, baptised 16 November "born from the legitimate marriage of André de Mestre aged 35 of the parish of Montastuc en Agenois and of Dame Thomase Hélene Cotterele aged 22 years of St. Etienne en ville de Rennes, married there in 1788". 31 December 1791: Inspection by M. de Behague, Governor General of the Windward Islands at Fort Royal, of the Regiment of the Royal Corps of Artillery in the colonies. "2nd Brigade, Company de Mestre. 1st Class Captain, present." 1793: Colonial Troops, Artillery Regiment: 2nd Brigade at Martinique and at Lorient. 1st Class Captain André de Mestre at Martinique. 1793 Birth of Prosper de Mestre, possibly on board a French ship bound for Martinique. 1793: Journal of General Comte Rochambeau. "Colonel Mestre of the Artillery had his head taken off by a cannon ball. I was covered with his blood and had a slight wound in the heel. This officer was of great merit, and his loss is irreplaceable. He was on the ramparts day and night, directing the artillery, the gun marker and the bombadier. He leaves a wife and two children; the Republic should take care of them and give them a pension, because this hero had no fortune at all except his talents, his courage and his qualities". It is fairly certain that Jean and André fought for the Americans against the British. A letter, dated 10 June 1977, from the Sons of the American Revolution, Branche Française, to M. Orny states "J'ai en effet trouve sur la liste des combattants francais pour l'independence americaine les 2 noms que vous m'avez donnés: André et Jean de Mestre." The letter goes on to invite any living members of the family to the 4 July ceremony at the Cimetière de Picpus. Dame Thomas Hélène Coterele (or Cotterel) was born in St. Etienne, a district of the town of Rennes in Brittany, France, around 1766. She was the daughter of Pierre Cotterel and Dame Jacques le Taneur. The name Cotterel in its various spellings is in fact an Irish name. There was a large Irish presence in France in the latter part of the 17th century and all of the 18th century. Paris was the capital city of Catholic Ireland's hopes and aspirations. An Irish Brigade formed part of the French army until disbanded in 1791. Nom assez rare, variante de Cotereau, Cothereau, Cottereau, patronymes surtout portés dans la Sarthe, sans doute originaires de la Mayenne. Le mot "coterel" désigne en ancien français d'abord un mercenaire portant un coterel (cotte courte), puis un bandit, un pillard. Autres formes : Cotrel, Cotrelle, Cottrel, Cottrelle, surtout portées dans la Somme. Hélène married André de Mestre in 1788 at Lorient which is some 137 kilometres from Rennes. From time to time André's regiment was garrisoned at Lorient. It is likely that the marriage took place between February and April of 1788 when André took 3 months furlough to sort out his father's affairs. Their daughter Melanie was born at Lorient in November 1790. Hélène is mentioned in Rochambeau's journal as the widow, with two children, of André de Mestre, the officer killed at Rochambeau's side at Fort Royal, Martinique. Very little is known of Hélène's personality or political views except a story in a letter from Helen Williams (nee de Mestre 1825 -1907) to her sister Melanie Lovegrove written c. 1880 "my grandmother became an intimate friend of Josephine, then Mme de Beauharnais. After Josephine became Empress of France, she wrote to my grandmother saying that the Emperor would return the estates that had been confiscated if she would send my father to the free schools established by Napoleon. She refused saying "Nous sommes Bourbons!" It is quite possible that Hélène knew Josephine personally. Josephine Beauharnais was on Martinique between 1788-1790. Although it is not certain where André and Hélène were at that time, it is quite probable that they were also on Martinique and would have moved in the same social circle. In March 1794 André was killed and the British took Martinique. It must have been a very difficult time for the young widow with no pension and two small children to care for. It is not surprising that on 2nd March 1795 she married Jean (John or James) Armstrong, an officer of the King's 6th Regiment of Foot - later to become the Royal Warwickshire Regiment - which took part in the capture of Martinique in 1794. The marriage was authorised by Msr. Dubuc the Administrator of the colony and Brigadier General Colin Sinssay who declared the service did not have to be in English. The witnesses to the marriage were Dr. Richard Fletcher, surgeon of the Fort Hospital, Mr Hutchinger, officer of the Kings 6th Regiment, Jean Baptiste Naux, Knight of St Louis, Colonel of French infantry and former governor of Tobago and Fr. Jean-Louis was the priest. Little is known about her marriage to John Armstrong. John was reportedly killed at the storming of St. Lucia in 1802. There was a child of this union, Andrew Cottrell Armstrong, born c. 1796, died in Hinds County, Mississippi. Shortly after the death of John Armstrong, Hélène married a third time to Joseph Coulon and moved to New Orleans. Joseph may also had children from a previous marriage. Hélène and Joseph had two sons, Joseph Paul Coulon born 1 September 1804, who continued to live in New Orleans and Adolphus born in Philadelphia who emigrated to Australia in 1832 . 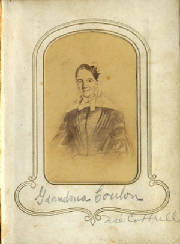 Hélène died in New Orleans on Sunday 14 December 1851. The day we visited Montastruc was cold and wet and the old bastide town looked distinctly grey and forbidding. However, there was a woman gardening and when I asked if she knew the 'de Mestre' name she in typical French fashion immediately fetched her car and led the way to Monsieur Raymond Sigalas a former mayor of Montastruc who had researched three leading local families including the 'de Mestres'. One or two minutes either way and it might have taken years to obtain the information he produced. The family had been researched because of its military connections which go from 1580 to the death of Andre in Martinique in 1794. Hopefully this French side of the family will lead to new contact and more 'cousins'.